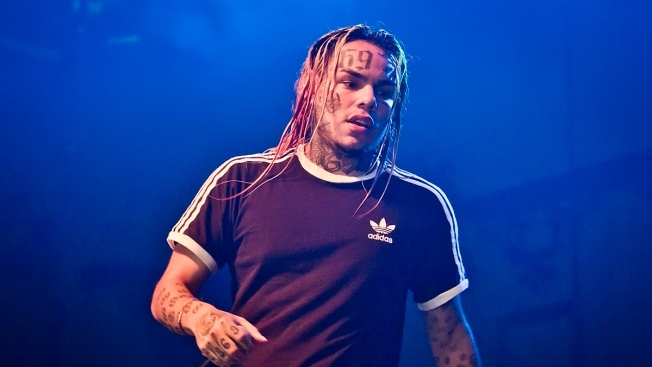 In this July 7, 2018, file photo, American rapper 6ix9ine performs in Berlin, Germany. The rapper known as 6ix9ine says two men forced him from a car at a New York City intersection and robbed him of jewelry. The NYPD says the rapper went to a police precinct early Sunday to report what happened to him. The rapper was riding in a Chevy Tahoe on Atlantic Avenue, near Bedford Avenue, in Bedford-Stuyvesant in Brooklyn around 4:25 a.m. when a dark sedan bumped the vehicle, the NYPD said. After the bump, two men got out of the sedan, approached the Chevy Tahoe, displayed a firearm and took the 31-year-old driver's cell phone, police said. The men then forced the rapper to get out of the Chevy Tahoe and into the sedan at gunpoint, according to police. The men drove the rapper to a home in Bed-Stuy, where they forced him to call another man to bring him some personal property, which he did. The men started driving away with the jewels — with 6ix9ine still in the sedan — but at some point, the rapper jumped from the vehicle while it was still moving, the NYPD said. The rapper walked to the 79th Precinct to report the incident around 5:05 a.m., police said. He was taken to Kings County Hospital, where he was treated for non-life threatening injuries. Police say the rapper became uncooperative after filing the report, but the 31-year-old who was driving the Chevy Tahoe spoke with them. 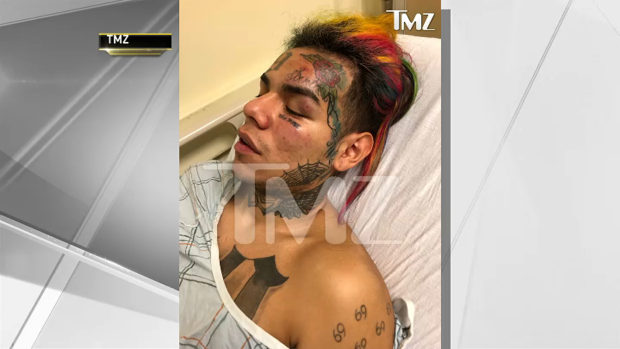 It wasn't clear whether 6ix9ine was attacked by the men, or if he was injured when he jumped from the moving car. TMZ first reported on the incident. No one has been arrested, and the investigation is ongoing. Brooklyn rapper 6ix9ine, also known as Tekashi69 and Tekashi, was born Daniel Hernandez. His hits include "Gummo" and "Keke." Last week, he appeared in court in Houston to pay bond on a misdemeanor assault charge and posted a photo to Instagram. He's accused of choking a fan at a Houston mall, according to reports.